Providing collectors with another female-based release, 2017 Topps WWE Women's Division is not just sugar and spice. Covering both WWE and NXT subjects, the set is exclusive to Walmart. 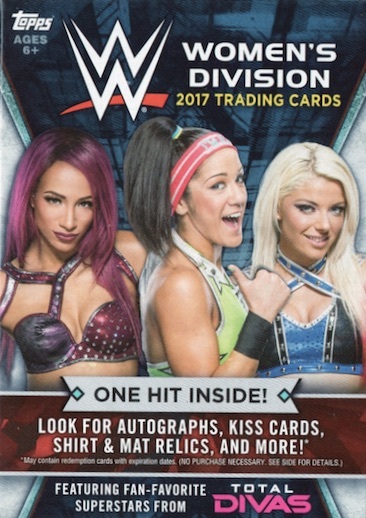 Reminiscent of 2016 Topps WWE Divas Revolution, the retail-only product packs at lot into the lineup. Working with 100 cards split evenly between Roster Cards and Matches and Moments, the base set offers rising stars, all-time greats and notable events. 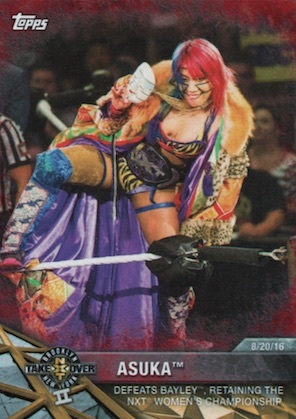 2017 Topps WWE Women's Division also features a pair of inserts, with 25 Rivalries cards, exclusive to Fat Packs at three per pack, for those that have prior beef. Only found in Hanger boxes (5 per box), 24 Finishers and Signature Moves cards highlight a preferred technique for each wrestler. 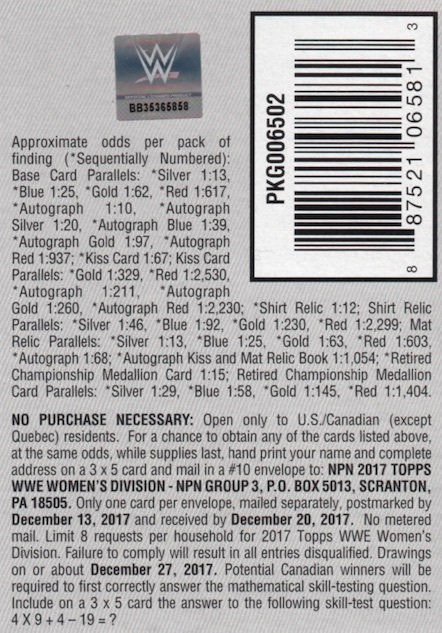 The 2017 Topps WWE Women's Division checklist also adds Autographs from top options like Trish Stratus and Alexa Bliss, as well as 37 other ladies. Sticking with the the normal assortment of relic choices, memorabilia inserts come as base Mat Relics and Shirt Relics. There are also Mat Relic Autographs and Autographed Kiss and Mat Relic Books. 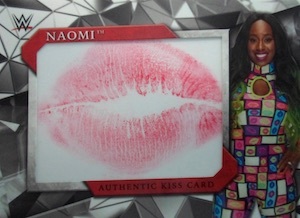 Finished with a lip stain, Kiss cards are found signed and unsigned. Finally, the Retired Women's Division Championship Commemorative Relic set honors winners of the Divas Championship and WWE Women's Championship. 39 cards. Serial numbered. Shop on eBay. 24 cards. 5 per Hanger box. Shop on eBay. 44 cards. Serial numbered. Shop on eBay. 25 cards. 3 per Fat Pack. Shop on eBay. 12 cards. Serial numbered. Shop on eBay. Good: Very affordable formats; female-only sets are still unique; fairly extensive signers list; hits are numbered. Bad: Not much variety in the blaster; designs don’t feel fresh. The Bottom Line: Following up the retail-only, female-only Divas Revolution set from last year, 2017 Topps WWE Women's Division seems tad a bit more simplistic, especially if you are sticking to one format. Nevertheless, if you have an inkling for some of the top names in women’s wrestling, the set is worth a look. Okay, so the 2017 Topps WWE Women's Division blaster box has 81 cards. That yields 40 base Matches and Moments, 40 base Rosters, and the one hit. Both of the deigns come from prior products, which was disappointing for me. Roster takes the flagship 2017 MLS look, and Matches and Moments uses Road to WrestleMania. Both are very different, with Roster going for simple and white-filled, while M&M is darker with more effects. These are literally the only two designs for my entire blaster since I also pulled a base autograph parallel. Speaking of parallels, they aren’t very easy to pull or spot. I actually caught the one-of-one Red in my box on the third pass. That was the only parallel. Of course, there are other possible hits with different designs and the Hanger and Fat Pack formats each have an exclusive insert. The 2017 Topps WWE Women's Division base checklist is interesting. Instead of a standard 100 cards, you get 50 Matches and Moments, split unevenly (26 vs. 24) between NXT and WWE, and 50 Roster cards. The Matches and Moments cards span events from 2015 to 2017, with the date noted on the front. The card numbers are also a little odd since they start with the subset prefix (NXT-1 to 26 or WWE-1 to 24). I would imagine this is so they do not get confused with the Road to WrestleMania set, but I would have hoped for a better system of organization. Otherwise, the checklist is about the hits. The main autograph set provides solid coverage of past and present. And there is the normal selection of relics (shirt, mat and commemorative) and kiss cards. Since we normally deal with hobby boxes, a $20 blaster is a little harder to value. One guaranteed hit is nice at that price but it can also be a mat/shirt relic or manufactured belt rather than an autograph. Beyond that, not a ton else of value comes from a given blaster based on the odds. I lucked out with a one-of-one base parallel but that is not the norm. The good thing about the blaster price is that you can buy one and see if you like it. If you don’t, it’s only $20 compared to the normal $50-100 you drop on a regular hobby box. The way the Blaster format operates is not as conducive to fun, in my opinion. There is only one pack in the box, which is clear, and that has all the cards. I would have preferred normal packs with at least 5-10 in a box. Once I sifted through, I realized there were only two designs. But, having said that, destroying the odds by pulling a low-numbered autograph parallel and base parallel is pretty nice. Nice card design just like last years Divas Revolution set. Each different type of package has exclusive inserts. The blasters have a Relic per box. Hanger boxes and jumbo packs have their own inserts. My only complaint is that Paige was not included (again).